The exciting recent publication of Blake’s illustrations of works by William Hayley helps to present a much fuller picture of the period from about 1800-1805 in Blake’s career, which included his conflicted personal and professional associations with Hayley, his only extended sojourn outside of London to a cottage in Felpham, and the episode of his trial for sedition. During this time, Blake’s personal, social, aesthetic, and professional interests intersect through his extensive work for Hayley and in the correspondence though which they planned and discussed these illustrations. At the moment, we are preparing a second installment of letters that will help to augment the resources available within the Archive for exploring this fascinating period in Blake’s life. We are pleased to be able to make these materials available in multiple ways for users, who we hope will benefit from the multiple ways we have prepared for them to search and browse Blake’s works and papers in the Archive. When we publish the Hayley letters, our current list of “Related Works” will expand to include Blake’s illustrations to Hayley’s works recently published. 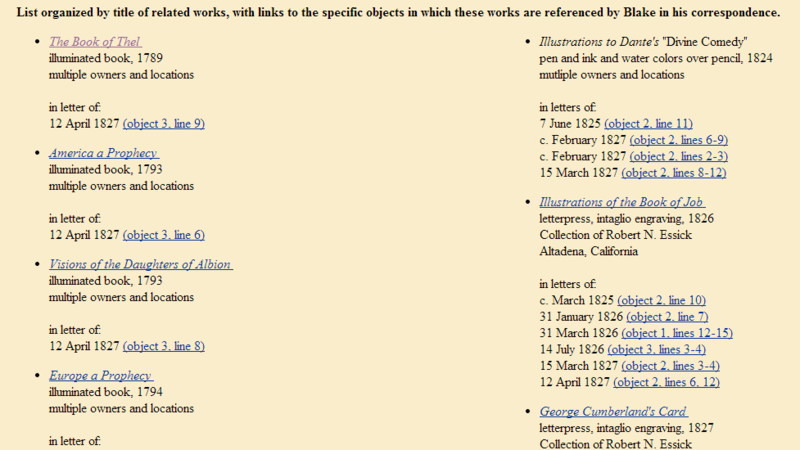 This curated set of links allows users to move quickly to the correspondence on a given work by Blake, even where that work is not referenced by title and would thus be hard to find through text search alone. Users interested in a particular work should also be able to use our collection of letters more efficiently by skipping directly to what they want within the group. Our aim is to provide not only new editions of Blake’s individual letters, but to continue to present new ways for users to explore and connect Blake’s multifaceted career. In future, as more and more letters are added to our current group, we may be able to provide additional options for sorting and filtering the letters by categories such as date, correspondent, location, and perhaps others. As in our decision to add and maintain links to the list of “Related Works” mentioned in Blake’s letters, these future options for adding new ways to navigate Blake’s correspondence should continue to support innovative approaches to studying and teaching Blake.